I recently(ish) bought a Love Rock LS125 and it came with a non Tokai hardcase. The problem is the headstock touches the bottom of the case, which is obviously less than ideal (possible due to headstock angle from what I've read). I've put a bit of material in to prop it up a enough so it doesn't touch the bottom but I'm going to get a better case for it. I can find the Tokai paisley cases for sale here but I'd have to buy it online without trying - is it fairly likely that one of these will fit perfectly or is there a chance I'll get the same issue? Any other brands worth trying? I've been looking at the ABS type cases (Gator, SKB) and wonder if anyone uses these. SCC, perfect fit, headstock pocket (this model case!) created for these kind of angles. I've got one of tokais pink-lined Lifton type cases and the fit is perfect, although one of the modern 3rd party hardcase makers would probably offer better protection. Hiscox. Everything else is a false economy. "As long as I stay between the 'Sun and my Shadow', I guess, I'm doing well..."
That's a great looking guitar!!!! It's about the cases marcus. Love that guitar. What's the story on it? It's a 2009 LS95S in Violin Finish, custom ordered by togps. Magnificent. I ordered a custom build from Gottfried also about the same time. 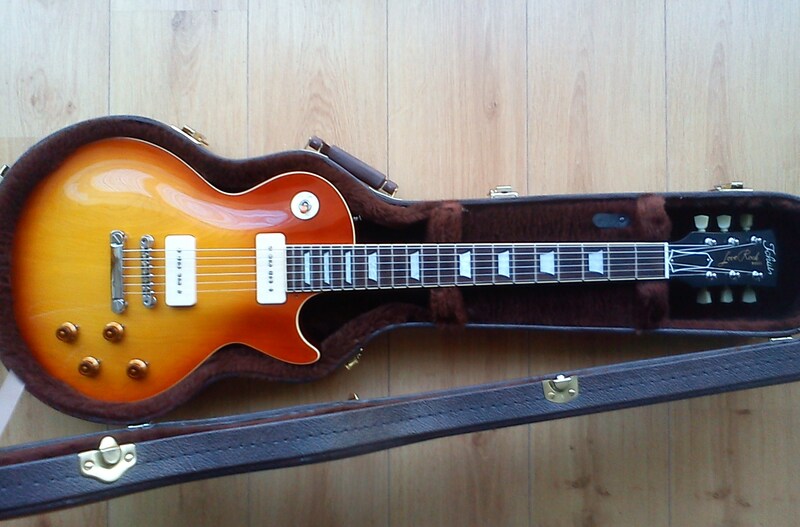 It is the 54 style goldtop (wrap tailpiece) of course with P90's. Love that guitar of yours! Thanks marcus, I think I remember your '54 from photos here on the forum, I also recall thinking 'not bad at all' either! Gottfried does some very nice custom orders!